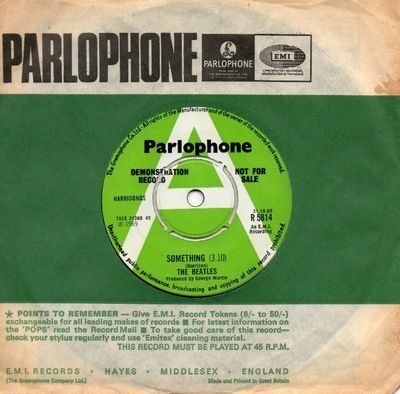 For sale, pretty rare Beatles Parlophone demo in really good EX/EX+ condition. I don't like to use the term mint or NM but this is a great copy. I have played it twice now once when I got it and once for this listing and it sounds fantastic. Not sure if it is in the correct Parlophone bag, as Beatles stuff isn't my normal genre, but its the one I bought it in. I bought it as an investment a year or two ago and following yesterday's sale, on ebay, of another copy I felt now may be a good time to list mine. I am a collector not a trader. I am also very proud of my 100% feedback so be assured you can bid with confidence. I will cover postage in the UK but overseas buyers will need to cover the postage and insurance as that can get expensive.